The two most important reasons a mosquito is attracted to you have to do with sight and smell according to Professor Jonathan Day from the University of Florida’s entomology department. In fact, lab studies indicate that 20% of people are high mosquito attractors. Pregnancy — Pregnant women get bitten about twice as much as the rest of us. That’s because the body temperature of pregnant women is a degree warmer than everyone else, and they exhale 21 percent more carbon dioxide (C02), a known mosquito attractant. Exercise — Working out builds up lactic acid in your sweat, making you more appealing. Movement is another cue. Clothing – People dressed in dark colors — black, navy blue, red — stand out more. And if you wondered whether all mosquitoes bite, they don’t. Only female mosquitoes bite because they are after a protein found in blood to develop their eggs. When not after your blood, they (like their male counterparts) feed off plant nectar. 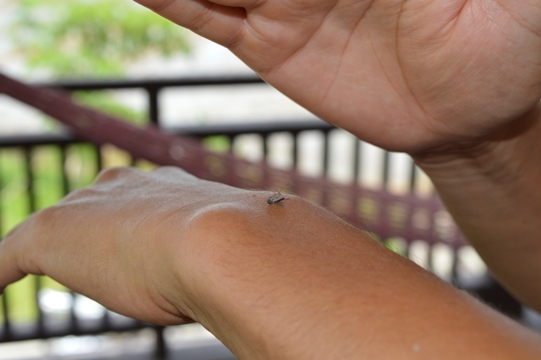 The more times you get bitten by a particular species of mosquito, the less you will react to that species over time. Unfortunately with over 3,500 species of mosquitoes worldwide that’s a lot of species and a lot of bites! There are a lot of suggestions for soothing the discomfort of an allergic reaction to mosquito bites . Some are common-sense, some medical and some just a little odd. But they all have advocates who swear they work. Don’t scratch the bite. That only irritates your skin further and could lead to infection. Give it a light washing with soap and cool water. Zap-It! A nifty pocket size device which has been clinically approved and tested in the most extreme conditions by the London School of Hygiene and Tropical Medicine. Clicking Zap-It! several times around the area of a bite has the effect of localizing the poison and inhibiting the histamine release which causes the itch and urge to scratch. Zap-It! is a handy little device that uses no batteries or chemicals and is effective on up to 1000 bites. Calamine lotion. The pink goo, a favorite of moms everywhere, is a mixture of zinc oxide and iron oxide and works as a cooling, all-purpose soother. The Food and Drug Administration declared in the early 90s’ that it’s ineffective in treating itches, but doctors still recommend it. You might also try Caladryl, which contains both calamine and an analgesic to help relieve the sting. Aloe Vera Gel. Helpful to reduce swelling and itching, aloe vera also forms a protective layer, to reduce possible infection. Hydrocortisone cream. These over the counter creams contain corticosteroids which will counteract the effect of the histamines and help reduce the swelling, which should give you some relief from the mosquito bite itch. An anti-inflammatory such as ibuprofen will also help. Use a cold compress or ice pack. Histamines dilate the blood vessels, filling the affected area with excess blood. Cold causes the vessels to constrict, so that the amount of blood is reduced around the bite. Take an antihistamine. This won’t work immediately, but an OTC medication like Benadryl will prevent histamines from binding with receptors at the blood vessels. The vessels in the bite area return to normal, and the swelling and itching dissipates. Remember, you can take an antihistamine before going outside to minimize your allergic reaction to a mosquito bite. Dab on some baking soda paste. For some reason, the Mayo Clinic doctors – and dozens of home-remedy advocates – suggest adding a bit of water to regular baking soda, then applying the paste to the mosquito bite. The reason isn’t clear, but it apparently helps relieve the itch. Treat with Heat. The protein that causes the itching is destroyed at around 40.5°C (that’s 105°F). Boil up a cup of warm coffee or tea and place that cup on your bite for about a minute or so. Theoretically the heat from the cup “neutralizes” the proteins that are the cause of that itching and swelling. Evening Primrose Oil. Dr Alan Greene, pediatrician and prolific health writer, suggests that some natural anti-inflammatory remedies such as evening primrose oil may also help reduce the swelling and itching associated with mosquito bites. These are some of the steps you can take in the hours immediately after a bite. But remember, if you start feeling sick in the days ahead, particularly if you feel flu-like symptoms that include neck stiffness, headache, nausea and fever, then it’s possible that mosquito bite left you with something worse than just an itch. Don’t Delay…..Go to the doctor.